Lock in a great price for Hotel Le Château – rated 8.7 by recent guests! Very comfortable and warming. You can walk to the town center from here but cross the road before you do! Beautiful and charming property. Good location close to town center. Our room in the third floor was very cozy, comfortable and clean. Breakfast was very good and varied, with many options of pastries. There is a nice garden in the backyard, which is worth checking out on a morning walk. The staff is very friendly, always ready to help and to inform the guests. The staff were very friendly and went above and beyond. Um espaço maravilhoso proporcionando um otimo relax.Funcionarios prestativos e educados e otima localizaçao:perto do centro e longe do barulho. Café da manhã excelente. A localização é limpeza são ótimos. Minha experiência foi incrível! Começando pela ótima localização, inclusive saímos à noite a pé e foi super tranquilo. O hotel é impecável, desde o atendimento no check-in, até o check-out. O quarto era perfeitamente limpo e aconchegante. Serviço de quarto ótimo e café da manhã delicioso, com opções para todos os gostos e dietas. Além de um lindo jardim, a estadia foi de completa paz. Hotel charmoso. Com drink de boas vindas! Piscina realmente aquecida! O café da manhã era muito bom, com muita variedade. A localização é muito boa, e o hotel é bem calmo, ideal pra quem vai com crianças. Hotel Le Château This rating is a reflection of how the property compares to the industry standard when it comes to price, facilities and services available. It's based on a self-evaluation by the property. Use this rating to help choose your stay! 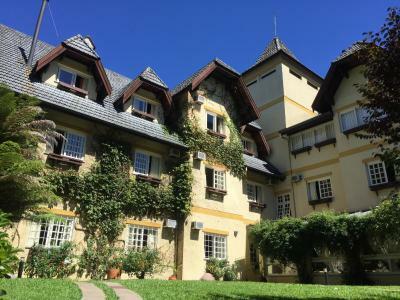 One of our top picks in Gramado.Hotel Pousada Le Château is nestled among hundreds of pine trees and picturesque gardens. 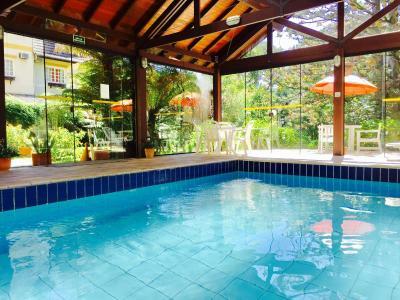 It is just 5 minutes’ walk to the Gramado city center and features a swimming pool. The modern rooms at Pousada Le Château are tastefully decorated and well-appointed. Each air-conditioned room provides a satellite TV and private bathroom. For relaxation, the Hotel Pousada provides a sauna, fitness center and afternoon tea. For convenience, there is free private parking, a business center and 1 welcome drink. When would you like to stay at Hotel Le Château? This room has a mini-bar, air conditioning and satellite TV. Bathroom is private and extras include free toiletries. This suite has a fireplace, bathrobe and air conditioning. 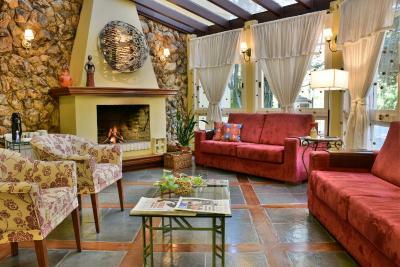 This spacious air-conditioned suite has a fireplace, sofa and a flat-screen TV. Bathroom is private and extras include free toiletries. This double room has a mini-bar, private entrance and flat-screen TV. This suite features a hot tub, satellite TV and view. This suite has a satellite TV, fireplace and bathrobe. House Rules Hotel Le Château takes special requests – add in the next step! Hotel Le Château accepts these cards and reserves the right to temporarily hold an amount prior to arrival. The Hotel Pousada Le Château only accepts Visa or Mastercard credit cards. The hotel reserves the right not to accept bookings with other credit cards. Please note extra beds must be requested in advance and are subject to availability. The restaurant could be better for lunch and dinner. The menu offers few options and service seems amateur. The apartment requests little repairs (water leak and vase seat). They did not have heat in the rooms and the guy in the reception was trying to explain us that is automatic heating and can not do anything. After two days we got upset cause they did not have even hot water the heat somehow was for 24 h and the hot water as well. Also they were hiding amenities such us shower gel for no reason and we find out in the last day. They could not provide us even slippers. Also they did not have a safe box inside the rooms. In conclusion this is a 2 to 3 star hotel and the only positive I can say is the brazilian guy in the reception; not the one with the bear, who.was friendly and helpful and of course the location that is walking distance from the center. However there are many hotels in the center that you can look for. Definitely not recommended. We booked a superior luxury room but weren't provided with this room. We then had problems with the facilities in the room as soon as we checked in and there wasn't a manager on site to deal with the matter. the bed was very soft, the warm water disapeared we have waited 30 minutes to come back, somebody entered to our room. As Taxas cobradas no check-out. The safe in our room malfunctioned twice and in both occasions it took the staff too long to fix it, leaving us in the room with the safe beeping loud and annoyingly. There was a small misunderstanding when our clothes came back from laundry, and one of the room maids felt personally offended and approached us directly, which was very unprofessional.